My review of the new Retina iMac could be said as one word: sensational. I once read that a man buys something for two reasons: a good reason and the real reason. I bought a Retina iMac for a very good reason: my primary computer — an aging MacBook Air — was due for an upgrade. But the real reason? It’s a 27-inch Retina monitor and it is astonishing. Of course, it wasn’t entirely an easy decision to make. For as long as I’ve owned my own computer I’ve loved laptops. I love that I can close the lid, put the computer in my bag, and take my main work machine with me anywhere I want. There’s no syncing between two machines, or wondering if this or that file is on the computer or not, and no compromises when I’m on the road. And so the choice to get the Retina iMac was also a choice to give up my perceived sense of freedom and portability that comes with having a laptop as your one and only computer. And honestly, it’s turned out to be not a big deal. Over the past few years since I began writing here as my full-time job, a few things have changed regarding my work habits. For one, I work here at this desk in my home for about 80-percent of my hours. There were a few months at the beginning of this year when I was commuting to a local co-working space, but that didn’t quite stick for me (but that’s a story for another day and it’s underpinned by my hope that WELD will one day come to Kansas City). Secondly, when I do travel to a conference or drive to a local coffee shop for the day, I mostly prefer to take my iPad. The work I do revolves around reading, writing, and communicating with my team. All of which are things I can do quite easily from my iPad thanks to apps such as Instapaper, Drafts, Poster, Unread, Editorial, Slack, Mail, Basecamp, OmniFocus, Safari, and Pushpin. All that said, leading up to Apple’s special event I knew I’d be upgrading my MacBook Air. The question was, to what would I be upgrading? Plan A was a 13-inch Retina MacBook Pro and a Thunderbolt Display. The new computer to replace my old Air and the new Display to replace this grey market IPS display as a stop-gap while I waited held my breath for an updated Thunderbolt display (if there’s one thing I’ve learned in the past decade of being an Apple user it’s to not hold my breath waiting for updated external displays). But there was a rumored iMac with Retina display that was throwing a wrench in my upgrade plan. And as I thought about my various upgrade options — either stay a laptop-plus-external display user, or switch to become a desktop user — I thought about how I mostly work. And realized that the vast majority of my computer working time is spent at my desk. I’ve been mostly using my Air in clamshell mode practically since I bought it in 2011. And here at my desk, it’s more than just the computer that I have going on. I use a standing desk, a clicky keyboard, and gigabit internet. There are many incentives (comforts, really) that make my home office workstation comfortable, efficient, and preferable. Honestly, I like it here. And so I decided that I was willing to double down on my home-office setup and that my next main Mac would become a desktop machine if it meant I could get a Retina display. Welp, that’s exactly what happened. Apple announced the new iMac with its Retina 5K Display, and I ordered one right away. I’ve been a Mac user since early 2005 when I bought a 12-inch PowerBook G4 so I could learn Photoshop. And if the last decade is any indication, I use my computers for almost exactly 3.5 years. And so I try to get the highest-specced version of a machine that I can afford so as to prolong its usefulness. When ordering my iMac I went all out. It has the upgraded processor (4 Ghz Quad-Core Intel Core i7), the upgraded graphics card (AMD Radeon R9 M295X 4GB GDDR5), the 1TB SSD, and 32GB RAM (via OWC’s upgrade kit). In short, I kinda ordered the absolute top-of-the-line iMac. But it’s worth it, and here’s why. The step up CPU and GPU were an easy choice. It’s $500 extra for both, but considering this is a bleeding edge machine with a bazillion pixels to push, it seemed prudent to get the better graphics card and processor in order to handle the screen. My personal computing needs consist mostly of open browser tabs and text documents — hardly the sort of work that demands the top-of-the-line iMac’s outrageous horsepower. But my gut tells me the iMac’s 14.7 million pixels will appreciate the octane, and I’d rather be safe than sorry. I’ve got 18 applications with 22 windows open at the moment, and when I invoke Mission Control it’s about 98% smooth as butter. Meaning, if I’m looking for pauses and stutters, I can kinda notice one, but then it’s gone the next time. And every other graphic animation — scrolling, moving windows around, resizing, minimizing, maximizing — looks perfect (save Time Machine, which I’ll get to in a bit). David Pierce reports of there being some tearing during fast-paced graphics games, even on his high-end review model. In my usage over the past week I haven’t seen any tearing, but I also don’t play any games on my iMac. Upgrading the RAM was another easy choice. There’s a little plate in the back of the Mac that pops out and it’s a piece of cake to add new memory yourself. It took me about 5 minutes. And OWC has a page set up with recommended upgrade options. The iMac ships with 8GB of ram as 2 sticks of 4GB. The most reasonable upgrade is to simply add two more 4GB sticks to get a total of 16GB. You can get this from OWC for $100. I decided to go all out and upgrade to 32GB of RAM because we all know Safari will drink that RAM up like liquid gold once she’s got more than a few open browser tabs. I hear extra memory is also helpful when working in Lightroom. And as for the storage. Well, I went with the 1TB SSD for the sake of minimalism. Seriously. I went with the SSD instead of a Fusion Drive because I’m not a huge fan of the latter. I’m sure they’re great, but I’d rather stick with pure solid state. What blows my mind about the Solid State Drive is the Read/Write speeds I’m seeing. My very first SSD was an OWC Mercury Extreme Pro that I put into my aluminum MacBook Pro back in 2010. At the time it had a read/write speed of 134 and 109 MB/s respectively. And when the SSD in my MacBook Air was brand new its read/write speeds were 265 and 248 MB/s respectively. As you can see from the screenshot above, the SSD in my iMac reads at 688 MB/s and writes at 705 MB/s. (!) That’s really fast. Compared to the baseline Retina iMac that Engadget reviewed, which included a Fusion Drive, my write read speeds are about the same but my write speed is more than double that of the Fusion drive. The reason I went with 1TB is because a bigger capacity hard drive makes life so much easier. It means I don’t have to juggle with storage, wonder which drive a certain folder is on, nor worry about if I have room to import a card full of photographs. I could get by with a 512GB drive because right now, all my data takes up about 400GB. But since taking up photography two years ago, it has become a very serious hobby, and I’m taking more pictures now than I was 2 years ago. And so the reason I wanted the biggest drive is so I wouldn’t have to start playing file storage musical chairs again in just a year from now. Having a larger internal drive that can hold all of my files, also makes backups easier. With my MacBook Air, I had to offload most of my photographs and media to my Synology and then access those over the network. Not exactly a huge deal, but definitely a bit complex and also it meant I had two drives each with their own unique and priceless files on them. Therefore I had two drives which each needed their own local backup and their own offsite backup. The Synology is pretty awesome in this regard. It runs in RAID and thus internally has its own redundancy. Additionally, it can automatically back itself up to a local USB drive (just in case the Synology unit itself ever gets fried), and it can back itself up to Amazon Glacier or Google Drive (among other options). But the only thing better than having all my files available on an awesome network attached storage drive is having all my files on my main computer. Not to mention, even with NAS-grade hard drives and a gigabit network connection, I’m still only getting read/write speeds that are a fraction of those I’m seeing on my iMac’s internal drive. Now that all my files are on the iMac, I have just one local and one off-site backup to manage. I use SuperDuper and an external Western Digital drive for nightly clone, and I have a Time Machine partition on my Synology. Now that I’m no longer using the Synology as a media hub, its can be, and should be, so much more than a Time Machine destination. I’m going to do some research into using it as a VPN as well as possibly sync my Documents folder to the Synology because the iOS app for remote access to files is great (too bad there is nothing like that for accessing files on my Mac from my iOS device through Back to my Mac). The creative professional has long been one of Apple’s primary user demographics. And it used to be that if you were doing serious work, you bought a Mac Pro. But over the years, not only has the iMac line gotten more and more powerful, so too has the MacBook Pro line. In fact, over the past several years, many a creative professional has become a “laptop primary” person. Myself (previously) included. Anyone who deals with graphics and images and videos is always looking for fast and powerful. Naturally, it’s fun to have a computer that boots up faster than you can pour a cup of coffee. But it’s also practical to have such a beast. A more powerful machine means less time waiting for videos to render, apps to build, and photos to export. And that genuinely makes life better for a lot of us. And that’s why its so wild that the high-end Retina iMac is faster than the entry-level Mac Pro in some cases. This is not your mom’s iMac. And yet, despite what an amazing workhorse this computer is, you don’t buy it for the power. You buy it for the screen. For the first time in desktop computing history, the speed and power of this machine is not the primary story or selling point. Rather, it’s all about the display. And what a display it is. What I’m discovering is that the wonder of a Retina display is directly proportional to its size. The more I use and learn about this iMac, the more I’m amazed with it. It’s a ridiculously powerful computer underpinning a jaw-dropping display. Put those two things together and you get something truly special. I know you know this. Now, I’m someone who rarely does any graphic design, nor do I shoot or edit any video in 4K, and I’m a hobby photographer at best. What do I need a Retina computer for? I work with words all day long, and text is perhaps one of Retina’s primary beneficiaries. We’ve been saying this since the iPhone 4 came out in 2010, but it has yet to cease to amaze me: type on a Retina screen is sharp, crisp, and print like. And on a 27-inch monitor, it’s all better. Especially when this is the screen I am in front of for the vast majority of my work day. Yes, I have my iPhone with me all the time, but I spend exponentially more time in front of my computer than my phone. The most marketable use-case scenarios for the Retina iMac are for video and photography professionals. But if you deal with text and words as your primary vocation — i.e. writing, programming, editing, layout design, etc. — I think you’ve just as much reason to get a Retina Mac as those professional video editors and photographers do. As a writer by trade, part of me wants to argue that wordsmiths have even more of a legitimate reason to go Retina than those working with images and graphics. But, then I open up Lightroom to process some of my recent photography and I’m blown away at just how stunning my pictures look. So I guess we all have equal grounds. It was a week ago this morning that FedEx delivered my iMac. I get a new computer so rarely, that when I’m setting it up I use it as a chance to start fresh. Instead of using Migration Assistant to port over all the apps and settings and preferences from my MacBook Air, I simply set up the iMac with the clean install from the factory and only added files and apps as I needed them. While things are certainly a bit more tedious this way — especially the first day of setup — I like having the chance to once again pick and choose which apps I install. It lets me start with only what I actually use on a regular basis. Dropbox and iCloud Keychain make things surprisingly easy in this regard. Most of my apps that have any sort of syncing engine (1Password, OmniFocus, TextExpander) are up and running just as I left them on the MacBook Air. Others, such as Keyboard Maestro, Transmit, and Hazel, I had to export my settings out of those apps on the Air and then import them into those apps on the iMac. This is one area where the Mac App Store shines. Installing a dozen or more apps from the MAS is as simple as scrolling down the list of purchases and clicking “Install”. For those apps I own which I didn’t purchase through the MAS I needed to go to the respective website, download the free trial, launch the app, and then dig up and enter in my license info for that app. After syncing my Dropbox folder I then just copied over all the files in my Air’s Documents folder, all the music and photos from my Synology. And while that was running, the apps I installed right away were Dropbox, LaunchBar, TextExpander, and 1Password. After those I installed Byword, MarsEdit, Reeder 2, OmniFocus, Rdio, Coda 2, Transmit, Bartender, Hazel, Backblaze, Lightroom, Day One, Fantastical, iBank, Droplr, Simplenote, and Tweetbot. But not in that order. On my Air there are 216 items in the Applications folder. On my Mac, there are currently just 66. Feels good. I have 2-factor authentication enabled on pretty much any service that offers it. This was the first time I’ve gone through a complete ground-up setup where all my logins were guarded by verification codes. To my surprise and delight, it was surprisingly painless — and even encouraging — to use all the 2-factor authentications I have set up. As mentioned above, my photography hobby has been the biggest bane to my MacBook Air. Both in terms of storage space and processor capabilities. As explained earlier, the guts of my iMac have obliterated my two biggest pain points with photography. The new computer (a) has plenty of storage space to hold all the photographs I’ve taken over the past 2 years with room to spare for the next few years’ of photos; and (b) has the processing power to work much more quickly in Lightroom. Beyond the fact that it’s a better computer for doing photo editing, it is a vastly superior screen. My Olympus shoots RAW images at 4608×3456 pixels. It’s bigger than 4K video, and quite a bit taller as well. So I can’t fit 100% of my image onto the screen while working in Lightroom, I can however view it at 50% pixel-for-pixel resolution and it looks so nice. Looking at the photograph above (click here for full size), you can see some lines and odd graphics where there should be smooth graphics and gradient shadows. I asked around on Twitter, and several other folks are seeing the same thing with Time Machine on Yosemite, and, from what I can tell, it’s pretty much only an issue on Macs with Retina displays. Which includes not only the new Retina iMac, but also the Retina MacBook Pros. However, if I take a screenshot of what you see above, then the screenshot doesn’t capture any of the graphics oddities. It looks just fine. I notice when I’m recording a podcast and my MacBook Air’s fans are loudly blowing because some runaway app is using way too much processor power. When I ran stress-testing processor and GPU-based tests on the iMac, the fan would definitely come on, and in a quiet room it was audible. It was also, to my mind, vastly quieter than the fan in my MacBook Air. The iMac’s not going to match the Mac Pro for quiet fan blowing, but neither is it going to beat out any Mac laptops in a contest to see who can make the most noise. I can’t remember the last time my MacBook Air’s fans weren’t running at full speed and volume. And while my iMac certainly does have an audible fan at times, even at its “loudest” it’s nearly unnoticeable except when my office is completely silent. These Miur icons (set 1 and set 2) from Sebastiaan de With are fantastic. I’m using his replacements for Lightroom, Slack, and Rdio. This terminal command to get the dark-themed Dock while keeping the light themed Menu Bar sets you up to have the best of both worlds. Last week, Ian Hines asked me how apps and websites hold up in on the Retina screen. The fortunate answer is that they hold up extremely well. This iMac is not the first web-connected Retina device, nor is it the first Retina Mac. And so, at this point, the vast majority of websites and Mac apps have been updated to look great on a Retina screen. While I do encounter some blurry bits on occasion, they are few and far between. The only downside I can think of with this computer is that it cannot run as a standalone monitor. When I’m standing here, using the iMac, I keep thinking about how it’s all about the screen. But what’s crazy is that the screen is only half the story. Inside this iMac just so happens to be one of the fastest Macintosh computers on the planet. Take away the Retina display and you’ve still got an incredible machine. But you don’t have to take away the display. 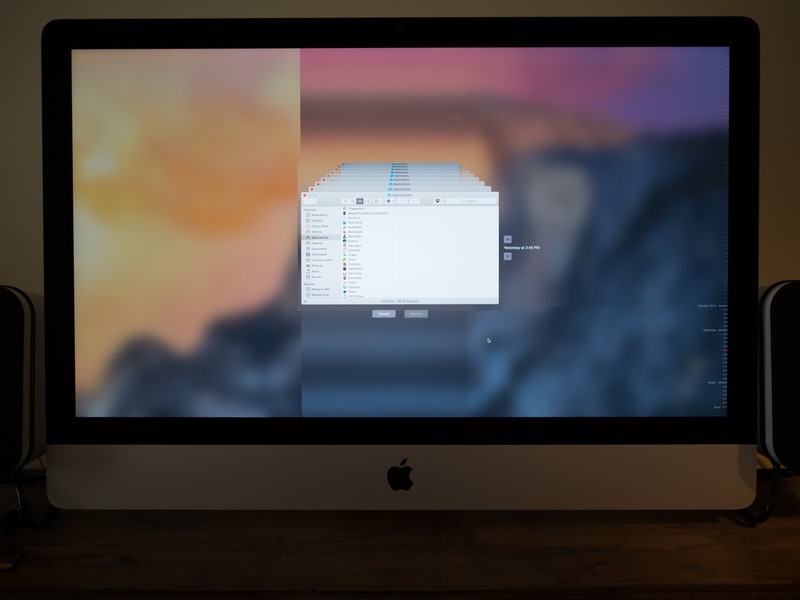 With the Retina iMac you’ve got your cake and you’re eating it, too.